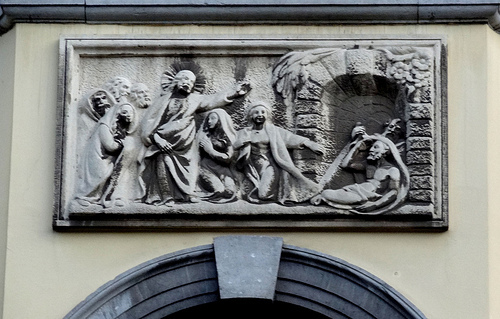 The story of Jesus raising Lazarus from the dead is a well known story. It’s been used to illustrate all sorts of things: Jesus’ emotions and ability to form friendships, Jesus’ power, the lack of faith of the people who followed Jesus; the list could go on and on. And occasionally the story is also used in queer circles as a narrative of coming out, mostly because, in the pivotal scene of the story, Jesus calls to Lazarus in a loud voice saying, “Come out!” and Lazarus does. At first I was annoyed because it kind of ruins the coming out narrative. Coming out is a personal thing. We don’t want people helping us to come out (outing us) and we don’t want to do it on other people’s terms. We also don’t want them to ruin the moment for us by saying something like “I already knew” or “So what”? But the more I thought about it, the more I do see the parallel in Jesus’ words to the crowd and the modern coming out experience. Once the queer or trans person has come out; once we have revealed our truth to the people around us, there often is “unbinding” that needs to be done. And honestly, a lot of that unbinding has to be done because of cis/straight folks. Lazarus was wrapped tightly in his grave clothes. He didn’t do that to himself. Other people did that to/for him. They thought they were being helpful. They thought that they were honoring his body. But when Jesus raises him from the dead those helpful bindings become a trap. He is wrapped tight and he is unable to unwrap himself. And without being able to unwrap himself he’s probably having a hard time walking and moving, he’d have a hard time eating and maybe even breathing. I think about all of the things that were bound onto me. Beliefs about my body (that it was gross and disgusting, that it was mutilated, that it was deficient, that no one would ever love me in it). Beliefs about my sexuality (that it was dirty and depraved, that it was sick, that it was unhealthy). Beliefs about what it meant to be queer (depravity, promiscuity, drug addiction and STIs). Beliefs about what it meant to be trans (deluded, sick in the head, confused). Beliefs about my future (death, depression, sickness, loneliness). Beliefs about my faith (that I couldn’t be a Christian, that I was going to Hell, that Satan had a hold on me). The list goes on and on and on and on. All of these messages got wrapped around me, woven around my heart and through my head, and held me tight. And certainly I had to do my own work to untangle those beliefs from my own sense of self, but the bottom line is that I never should have had to do that work. Because those things that were wrapped around me were wrapped around me by straight/cis folks. So Jesus’ command to the people gathered to unbind Lazarus still applies today. What are you teaching your children about gender and sexuality and difference? Are they growing up believing that “boys will be boys” and “here’s what it looks like to be a girl”? Are you teaching them purity culture? What are the messages you are spreading in your church about what it means to be LGBTQ? Are you still spreading those old (and discounted) studies about depression and life span in the LGBTQ community? Are you perpetuating stereotypes about what it means to be trans by sharing memes with men in dresses or laughing at jokes at the expense of trans folks in sitcoms and movies? Are you using inappropriate language to talk about LGBTQ people? Are you voting for folks who are looking to erase the trans community, deny the rights of trans folks to serve their country, roll back health care protections for trans folks, etc.? How are you contributing to a culture that continues to bind LGBTQ people? And what will you do to be a part of the unbinding starting today?